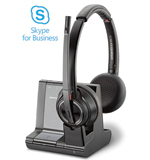 Plantronics Savi 8220-M Stereo Microsoft Skype for Business Certified wireless headset. It allows connection to 3 different devices. Savi 8220-M Stereo Connects to your desk phone, Microsoft Skype for Business softphone (via USB cable), and cell phone. Plantronics Savi 8220-M Stereo Microsoft is plug and plays with Skype for Business and it's Microsoft certified. The stereo (dual ear) noise canceling (ANC) speakers blocks out most of the background office noise. It can also be used as hi-fi stereo headphones to stream music from your Bluetooth device or computer. In addition, advance noise‐canceling microphone filters out background noise when talking on the phone.